1. Knowledge aim: students can master words about school building and the sentence pattern: do you have a library? 2. Ability aim: students can use the sentence pattern to talk about their own school. 3. 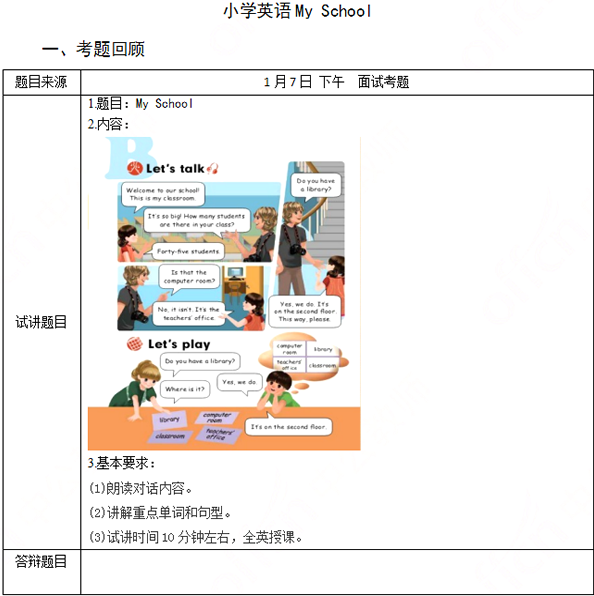 Emotional aims: students will be more confident to communicate with others in English. After greeting students, the teacher sing a song “My School” with students to warm up the class. They ask students: do you like our school? And which place do you like best? Students can have a free talk. Show pictures of some school buildings to teach new words, such as classroom, library, computer room, teacher’s office. And explain the function of these buildings. Then tell students that a reporter is visiting our school, and Amy is introducing our school to him. Let’s listen to their conversation. 1. Listen to the tape for the first time, and find out the first place that the reporter visits. After listening, students will find that the first place is the classroom. 2. Then listen again, and answer a question: do you have a library? And where is it? After listening, they will answer: yes, we do. It is on the second floor. Write down the question and answer on the blackboard. 3. The teacher reads the conversation and students can read after the teacher. Pay attention to the sentences on the blackboard. Show a map of our teaching building, and ask students: do we have a computer room/ library? They can answer: yes, we do/ no, we don’t. Next ask where is it, and guide students to find out the place. Then change the role, and students ask, the teacher answers. Here we can practice the sentence pattern. Then have a role play. Two students a group. One acts as a visitor, and asks another one about our school. Give them 5 minutes to make a conversation, and invite some groups to perform.